Spread the loving message of Christmas by sharing this article or image on your social media pages. May this article find you mindful, calm, and enjoying this miraculous never-ending moment. It is Christmas-time again, so I wanted to share with you some inspiring quotes from one of the most enduring and influential spiritual teachers: Jesus. But first, a caveat: as a gay person who endured much judgment and persecution from some people and institutions claiming to be Christian, I know that Christianity can be very triggering to those of us who have been harmed by deluded Christians. Thus, when I say “deluded” Christians, I am not implying that such Christians are misguided while I never am; that they are wrong and unworthy and I am right and superior. Instead, I just say “deluded” matter-of-factly, and free of all judgment, with love and compassion for them, just as I offer love and compassion to myself when I am ensnared by the compelling lies of delusion. Even though the Christian churches to which I attended as a youth did not preach judgment and hatred towards gay people, their silence on the subject meant that the churches that did preach delusion were more influential in shaping our culture on this issue. As a result, hatred and intolerance directed towards those of us who are gay, lesbian, bisexual, transgender, or queer in one way or another thrived and continues to thrive. Many LGBTQ folks have been killed, beaten, disowned, or emotionally scarred in one way or another due to this culture of judgment. Yet, having said all this, for those of us who have been burned by Christianity, it benefits us to not throw out the proverbial baby with the bathwater. Let’s appreciate and learn from what is good, kind, and skillful in Christianity and all wisdom traditions. In instances where the ego has corrupted the teachings, let us ignore those teachings; have compassion for those imprisoned by the egoic delusions; and teach love, kindness, compassion, and forgiveness through our own example. Although I had rejected Christianity for many years, thankfully my spiritual journey has helped me once again see the beauty, love, and wisdom of the faith of my upbringing. Part of this renewed appreciation for Christianity came from realizing that the judgment, hatred, condemnation, and violence of Christianity comes from the corrupting influence of ego, and not the true teaching of Christianity itself. 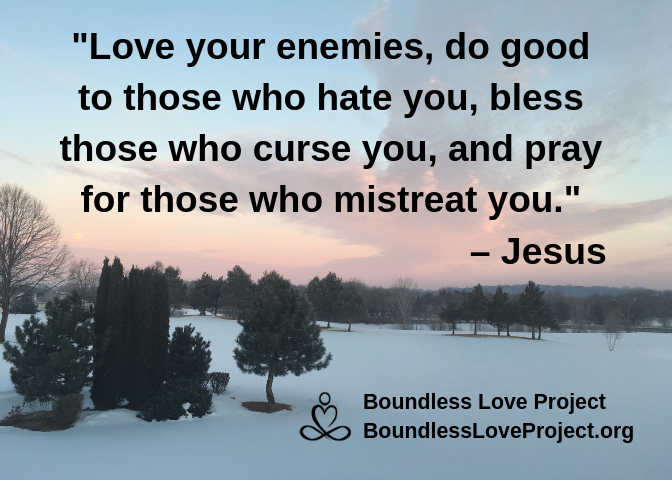 Jesus advised his followers to “judge not” (Matthew 7:1), “love your enemies” (Luke 6:27-28) and “love your neighbor as you love yourself” (Matthew 22:39). Therefore, I have chosen quotes from Jesus that highlight these fundamental Christian values: unconditional love for all life; prioritizing spiritual growth over material possessions; self-sacrifice; renouncing the delusions of aversion and greed by embracing the joy of service and skillful living; and abiding in truth to see clearly and let go of those delusions. I have also chosen quotes by Jesus that are more inclusive and applicable to everyone, whether a person of faith or not. At times, I paraphrase some of his quotes–denoted by using << >> instead of quote marks. This is so the core, loving meaning of his words is revealed in a more inclusive or understandable manner. I’m Sorry. Please Forgive Me. Whether you are Christian or not, I hope you find the words of Jesus included here uplifting, inspiring, and heartwarming. If any of what I say still triggers you, I apologize. Please ignore anything in this article that upsets you. That is why there are many wisdom traditions, both religious and secular, that at their core teach the same message of truth, love, and service. This gives us the freedom to ignore all that we find unhelpful, and just focus on those teachings that resonate with us, inspire us, and serve us in a truly beneficial manner. Thank you for any and all patience, understanding, goodwill, and forgiveness that you are willing to offer to me. Without further ado, let’s get to the quotes. All quotes by Jesus are from the New International Version Bible. I hope you found these quotes to be inspiring and heartwarming. Those that resonated with you, review often, that they may further encourage your spiritual growth. May your heart be open, courageous, and loving. May your mind be balanced, calm, and mindful. May your body be healthy, strong, and relaxed. Have a glorious 2019 filled with love, peace, and joy. Older PostEnd-of-Year Fund Drive a Success!